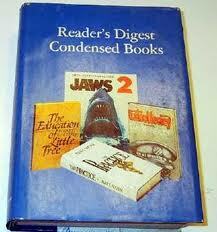 … the pointless horror of Reader’s Digest Condensed Books. Forty-seven years (1950-1997) of ‘simplifying’ bestsellers by cutting out style, passages that didn’t drive the plot and anything faintly racy… It is telling that these nutritionless, ‘uniquitous’ [?] tomes are now light years beyond valueless, and as difficult to dispose of as bins of radioactive waste. you canot sell them, you cannot give them away; op shops do not take them. They do not exude ‘retro chic’. They are soulless junk. And yet I understand the impulse behind condensed books. I find too many books too long. I wish writers had cut them down, pared them till they are reduced to their essence. Of course, the condensations don’t reflect this, but instead a popular perception that plot is all there is when it comes to novels. Interestingly, I think Fiona did her research on Wikipedia, but didn’t read carefully enough; from what I gather, Condensed Books continue as Reader’s Digest Select Editions.